Here you just define what happens when you click on a provider, choose the language of the program and define the default login/password to get used. When you have already accounts on certain sites that you want to use in our program, click on “Manage Accounts” and enter the data there to not create another account for the sites. If your Internet connection requires to use a proxy, or if you want to use random proxies, you have to define them here. The proxy options are the same as in GSA Search Engine Ranker. The timeout for HTML-Requests will define when to gives up on a provider to wait for a reply. Simultaneous submissions defines how many submissions are done at a time when using the automatic submission. You should be careful with the two settings as to many submissions at the same time might slow down everything as to much bandwidth is used. The settings in the screenshot should be good for everyone. Download preview for providers: This tries to create a screenshot of the webpage when you click on a provider. That's not required at all and many people would like to disable it as its just useless bandwidth and only improved the GUI a bit. Some providers will only accept submissions by email. So you have to enter the email settings here if you want a submission to those providers. 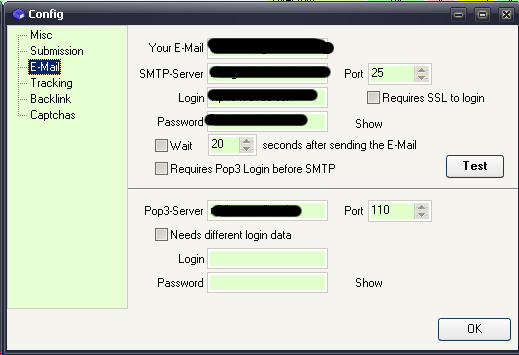 If you also want to use the “Email verification tool”, you should also fill out the data for the pop3 server. Unfortunately we can't give you the details what to fill there as each email provider requires different settings. You can find them when having a look in your default email client or by searching online with “@youremailhost pop3”. 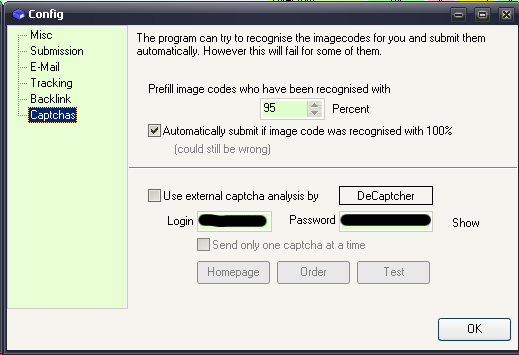 Captchas or image codes get displayed during the submission if the program was unable to fill them out automatically. Unfortunately it is very difficult nowadays to detect captchas without a human eye. 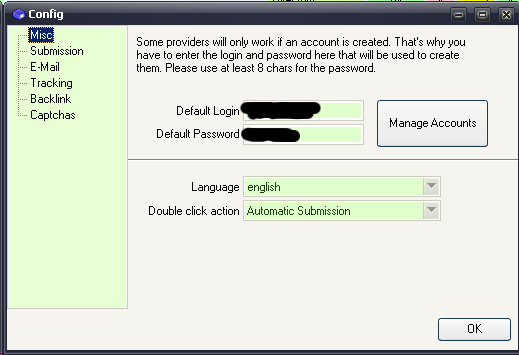 Still it is possible to automate the things if you make usage of so called external captcha analysis. You can choose between many different systems. The most common one is probably DeCaptcher.